Price: $20.00 includes shipping First Class mail. Bill Felker will sign your copy and include a dedication on request. Throughout the continental United States and Canada, the seasons follow the standard calendar less than they do the dictates of elevation and latitude. Although almost all deciduous trees between Maine and Florida have lost their leaves by January 1, the variation in temperature between the northern and southern states at the beginning of the year can be more than fifty degrees. Within that broad geographical context, the advance of the seasons is highly varied; nevertheless, certain patterns are visible that are applicable to much of the country. One way to delineate these patterns is to characterize them by what is going on in nature. Under this kind of organization, a season such as early spring has certain traits, but may occur in Louisiana in January but take place in northern Minnesota as late as the beginning of May. A floating calendar, one that is generally applicable to events rather than to specific dates, allows the observer to identify the season by what is actually going on in the local habitat rather than by the standard Gregorian calendar. Under such a floating system, the seasons truly are moveable in that they advance at different rates in different parts of the country. And within the broad guidelines sketched here, the Almanack traveler can watch not only the landscape change with the passage of the miles, but the time of year and seasons, too. 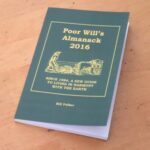 In Poor Will’s Almanack for 2015, I have divided the year into twelve seasons and have noted how they take place in different ways and at different times in the different parts of the country. Although I have kept the basic monthly sequence in the organization of information, I have noted the months during which a specific season might be likely to occur in different regions. These are broad strokes of the phenological pen, but they allow Almanack readers to not only see what is going on in their area but in other areas, as well. A standard Gregorian calendar measures passage and movement in months, weeks and days, neglecting other gauges like star time, sun time, moon time and weather time. Among those alternate systems, the last one may be the most neglected. The elements of weather time are the 65 to 70 major high-pressure systems that traverse the country, like deep breaths of the planet, between one winter and the next. These fronts move more quickly in the colder months (October through March bringing up to eight waves of high pressure in each month). The warmer months between April and September are more likely to have six or fewer fronts apiece. Every season and every year bring a similar number of cold or cool waves, and these are usually predictable within a few days. Lunar position strengthens or weakens the fronts. Changes in plants, animals and even people keep pace with those weather systems events and can be measured by them. The natural year unfolds, then, as a dynamic metronome, a resource of cadence and balance. When all the fronts of the year have passed across your property, the seasons are set to come back again. Of course, the calendar can easily tell you what day it is, but it can’t really let you feel your place in the turning clock of the world. The weather – if you will only count and keep track of its breaths – can! Each monthly chapter of Poor Will’s Almanack lists the dates that the major fronts of the year will cross the Mississippi River in its DAYBOOK section. Although successful fishing is influenced primarily by the type of bait used and the location of the bait in the water, the times of day, month and year are also significant. Lunar position has been shown in some studies to be a contributing factor to fish and game activity, but the approach of weather systems (high-pressure systems typically preceded by low-pressure systems) is usually a more decisive factor than the moon in influencing fish to bite and animals to feed. In addition to the moon and the weather, water temperature and other seasonal factors play a role in how fish respond to your bait. One of the best ways to measure those factors is to keep a journal of conditions and of what is happening during your outings. And an almanack may be helpful in making you aware of what is going on in nature. This is especially true for hunting, since conditions in the fields or woods have a direct impact on creatures living there. For both fish and game, however, your personal observations, connected to your results in the wood or on the water, form the true baseline for future activities. All that being said, the monthly section, the DAYBOOK section, provides pivotal dates for the arrival of high-pressure systems, which can be helpful in planning your outings. Fish, game, livestock and people tend to feed more and are more active as the barometer is falling one to three days before these weather systems. In addition, many people find that fish and game are more active (and dieting is more difficult) when the moon is overhead: at midday when the moon is new, in the afternoon and evening when the moon is in its first quarter, at night when the moon is full and in its third quarter, in the morning when the moon is in its fourth quarter. Second-best lunar times occur when the moon is below your location, 12 hours before or after those times noted above. The S.A.D. Stress Index in each monthly chapter of the Almanack is one way of measuring those natural phenomena which are assumed to be related to seasonal affective disorder (S.A.D.) — the day’s length, the percentage of probable sunlight, and the weather. In order to create the Index, each of those factors was given a value from zero to 25, and then the three values were combined onto a scale of one to 75. Interpretation is simple: the higher the number, the greater the stress. Index readings are most useful in combination with a record of your own moods. Reference to the Index when you feel out of sorts may be a way of getting a feel for how seasonal affective disorders influence your life. In general, planting crops that bear their fruit above the ground is recommended when the moon is waxing. Plant root crops, flower bulbs, trees and shrubs to promote root growth when the moon is waning. According to a number of studies, the moon exerts less influence on ocean tides and on human and animal behavior when it comes into its 2nd and 4th quarters. Therefore, it might make more sense to perform routine maintenance on your flock or herd near the date on which the moon enters its second or fourth quarter. On the other hand, tidal lunar influences have been proven to be greater at full moon and new moon times. You might expect more trouble with your animals, therefore, on or about new moon and full moon. Thirty-one years ago in February, my first Poor Will’s Almanack appeared as a column in The Yellow Springs News. Over a quarter century of putting together almanacks has given me a chance to explore everything from prostitution in my hometown to personal existential angst. If my columns have helped me clarify what I thought a small town should be, it also helped me clarify what I should be. Watching the seasons became a process of self-definition as well as definition of habitat. Through the years, I continue to find new ways to see the commonplace and to define home. Toward the end of the 1980s, I began to ask for reader contributions, and Almanack Literature was born. People wrote all kinds of things for my column: memory stories, outhouse tales, narratives about birthday parties, about unusual occurrences, about falling in love, and about their favorite animals. 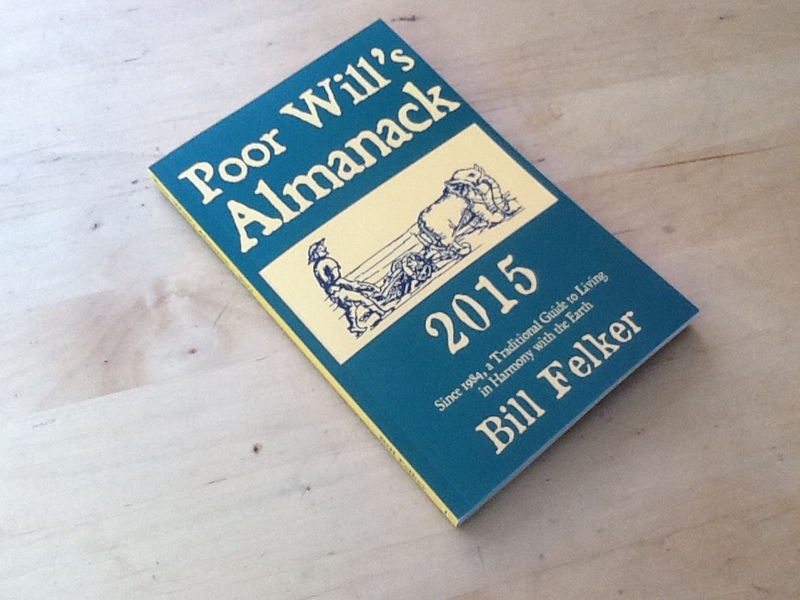 The stories included in Poor Will’s Almanack for 2015 are some of my favorites. That they are juxtaposed with a nature journal and astronomical notes may seem somewhat strange to some. And before I started writing almanacks, I would never have foreseen thecombination, for example, of outhouse stories with my very personal ruminations. An almanack, however, is a supremely eclectic genre; if an introvert with a lonely sense of fun were to select a way to combine both parts of his or her personality, almanacking might just be the path to follow. So Poor Will has not only helped me to take myself less seriously, but has also infused a community and a sense of humor into my solitary reflections and compilations. So the inclusion of stories by my contributors is organic to the process. We are all in this together.